n 1838, there were two services at St. Paul's, one in the morning and one in the afternoon, and many parishioners attended both? And the St. Paul's you would have attended was the original one located where Mayville beach is. This is according to the 1838 diary kept by 16 year old Mary Peacock, ward of her uncle and aunt Judge and Mrs. William Peacock. She and her sister, Sarah (who years later donated our Faith, Hope and Charity windows), spent much of the year in Mayville. Mary had been at a boarding school in Buffalo, but was brought home when military skirmishes with Canada broke out. Sara left her boarding school in Jamestown to keep Mary company. St. Paul's rector was "The Reverend Mr. Baldwin", assisted by a Mr. Murray. Mr. Baldwin called on the Peacock's three times that year. Once he brought along his silkworm collection, poised on a maple branch, for all to see. The only church special event that Mary mentioned was an evening of recitations by scholars from the Mayville Academy which packed the church. Mary visited two other churches that year to hear lectures on "Animal Magnetism" and "Electricity". Travel was limited, with walking being the main form. There was a stage to Westfield, and the steamboat to Jamestown, a round trip requiring an overnight stay. In 1838, the first steamer sailed on April 6th and the last on October 28th. Mary traveled from Buffalo on a "lumber wagon" and had two overnight stays en route. An occasional carriage or sleigh ride was a special treat. Calling on friends and relatives, often "taking tea", filled much time. Walks to the country or to the lake were taken in good weather. Evenings were spent playing piano, singing, waltzing, or playing parlor games. Weather determined much of how time was spent. Plans were often changed. 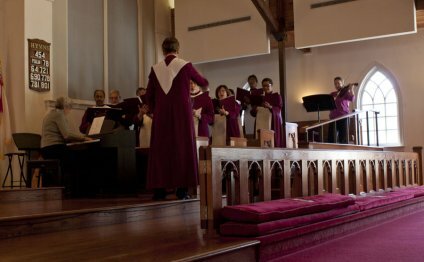 During the last 50 years our choir has had three sets of robes. Certainly that does not infer revolutionary moves, but is a gradual acceptance of opportunities for improved appearance, comfort and ease of care. The long black cassock (jumper-like and fitted), topped with a white cotta (fluffy blouse), and capped off with a black beanie often held in place with a bobby pin or two (you remember those!) was the choir uniform of 50 years ago. These were snug, often too warm, and had to be dry cleaned. In 1986, Wilma Coutant, former choir director, left a bequest to cover the cost of new choir robes. Again choir members were measured and fitted into new cassocks with standup collars. The big controversy was the move from black to a light blue, a shade often repeated in our stained glass windows. The beanie was tossed, and these washable blue cassocks with white cottas served for several years. Again comfort was an issue, especially as the membership of the choir changed as well as the sizes of the faithful. Additionally the wonderful washable material was fragile and subject to picks, as well as holding stains. So in 2003 it was back to the catalogs. The times called for comfort and ease of care. Loose fitting gowns seemed good, made of a more durable, yet washable fabric. Cranberry red was chosen as it picked up the red of the Prayer Books and red in the carpeting, and other red things Episcopalian. Easy choices of small, medium, or large, and long, medium, and short allowed for comfort, change, and flexibility. John Brewer, our organist, wisely insisted that we purchase two styles of reversible stoles. We have four choices and can match the liturgical calendar. We have green with gold on the reverse, and plain cream with white featuring an embroidered gold cross on the reverse. Thus our fashionable choir has robes of comfort, washability, and extra options, which should hold up for several years. St. Paul's church mouse is well and still on duty. Several years ago Jim Willcockson asked his "pet" mouse to take on the role of CHURCH MOUSE, and he placed the mouse up among the organ pipes above the choir. After receiving the hoped-for reaction of the female choir members, Jim's mouse retreated in fear and stayed largely hidden. While rebuilding the organ, John Brewer with Jim's help coaxed the mouse back to his favorite spot by the large pipes nearest the altar. The choir and most of the congregation have accepted this position for the mouse and so he is there any time there is a person in the church. God only know where he spends the rest of his time! But there is more. Our Sunday School children know about our church mouse and any time a new boy or girl attends St. Paul's, he or she is led up the steps, after church, and the mouse is pointed out, along with the statement, "See! We told you we had a real church mouse!" Properly impressed, the newly initiated awaits his turn to lead the next newcomer up to meet our mouse.